In this review we feature the best wireless Bluetooth speakers that deliver great sound at any budget. These speakers are designed to deliver high performance sound quality with wireless Bluetooth streaming on the go – they can produce plenty of volume and crystal clear sound for music listening both outdoors and indoors. The sound quality on these wireless Bluetooth speakers is smooth, detailed and crisp with deep bass response. Furthermore, these Bluetooth speakers come with long lasting battery life which makes them convenient to bring around without having to constantly recharge. They also have a portable and modern looking design which makes them very easy to carry around with you for party gatherings or by the beach or pool. If you are looking for the best sounding wireless Bluetooth speaker, be sure to check out our top picks below! The UE Boom 2 tops this list as the best wireless Bluetooth speaker overall and has a great combination of sound quality, durability, battery life, design and portability. The UE Boom 2 is specially designed to deliver really loud 360 degree sound with deep bass performance even in outdoor opens spaces, making them the ideal speaker for beachside or poolside parties. It comes with a full portable design with easy grip mesh which makes it great for carrying around. The entire speaker is IPX7 waterproof, shockproof and designed to take a lot of abuse from outdoor elements. 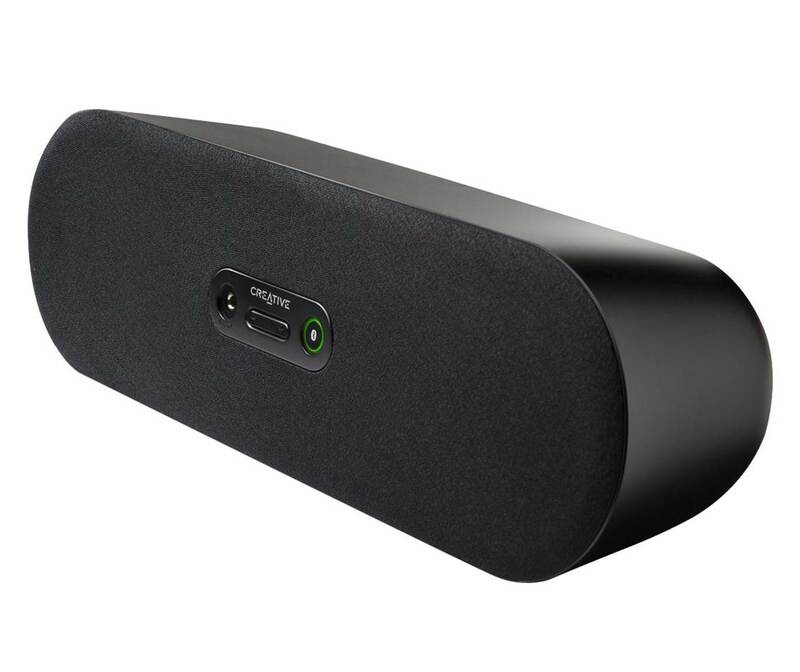 We also liked the fact that it comes with the PartyUp app from Ultimate Ears which you can use to wirelessly connect to more than 50 UE speakers to create a much wider soundstage. The UE Boom 2 comes with a really strong 15 hour battery life and a 100 feet Bluetooth range which is good. It also has an intuitive control system that allows you to play, pause or skip songs by tapping the speaker. The UE Boom 2 comes with a downloadable companion app and over-the-air firmware speaker updates. On the whole, the UE Boom 2 is one of the best wireless Bluetooth speakers you can find with excellent sound performance and a fully rugged IPX7 waterproof portable design. The sound performance of the UE Boom 2 is excellent and has plenty of volume to go around. The speaker gets really loud and you can crank up the volume to its maximum setting without expecting to hear any distortion. The UE Boom 2 provides 360 degree omni-directional sound which spreads out and disperses across longer distances to fill large rooms. The bass on the UE Boom 2 hits really hard but does not sound overwhelming or bloated – the bass hits tightly and stays where it should be as bass. 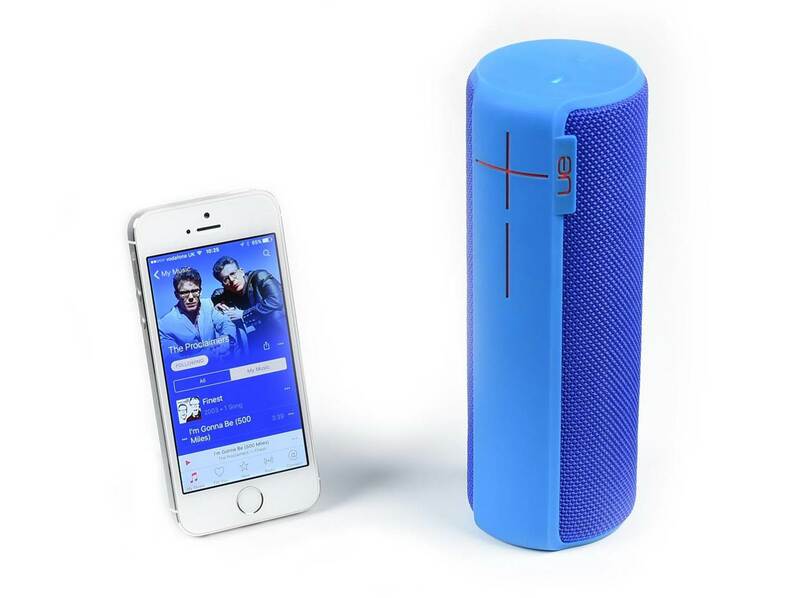 Music genres such as electronic dance music, rock or hip-hop sounded downright punchy through the UE Boom 2. The highs and midranges are crisp and clear with very detailed vocal performances. The timbre ranges sound nice with plenty of sparkle and without any hissing noises. The midrange feels solid and very well-defined with good lower-midrange punch on classic rock genres. As mentioned earlier, this speaker has plenty of volume and is powerful enough to fill up a large room at 50% volume level. We were able to crank up the volume to maximum without experiencing any distortion – although this may deplete the battery life faster. The Verdict? The UE Boom 2 is an impressive and one of the best wireless Bluetooth speakers that can deliver excellent sound quality and has a IPX7 waterproof and rugged design which can easily withstand a lot of abuse. It’s also currently available in multiple colors to choose from, so don’t forget to check it out! The JBL Pulse 3 is one of the best wireless Bluetooth speakers that delivers 360 degree surround sound with a stunning LED display. The Pulse 3 has a 360 degree LED lightshow which looks extremely gorgeous and visually stunning to look at – it is also IPX7 waterproof and has a rugged design which can resist the outdoor elements. The speaker produces 360 degree omni-directional sound which makes them great for large parties or pool gatherings to disperse sound over a wider area. Furthermore, the JBL Pulse 3 comes with a built-in 6000mAh rechargeable battery that can deliver a whooping 12 hours of playtime on a single charge. We liked the fact that the speaker comes with JBL Connect+ technology which allows you to wirelessly connect more than 100 JBL Connect+ speakers together to create a much wider soundstage. The Pulse 3 speaker also comes with a noise cancelling speakerphone which allows it to double as a conference call speaker. The stunning LED light display can also be customized in the JBL Connect app settings according to your preferences. If you want a stunning LED Bluetooth speaker that can deliver really solid 360 degree sound, the JBL Pulse 3 comes highly recommended. The sound performance of the JBL Pulse 3 wireless Bluetooth speaker is nothing short of impressive. It provides plenty of volume and the highs and midranges are decent and clear. The bass performance punches deep although not as deep as the JBL Xtreme. That being said, electronic dance music and bass-heavy music genres still came across as punchy and very solid. The timbre ranges on the Pulse 3 are well-defined and the midranges can be heard clearly. We also liked the vocal clarity coming from this speaker – the sound does not feel tinny at all or harsh. You get crystal clear sound with consistent sound quality while streaming music via Bluetooth. We also did not experience any dips in sound performance while streaming music through the JBL Connect app. The 360 degree sound from the Pulse 3 disperses widely and can fill up a pool area easily at around 80% volume. There speaker drivers do not distort at higher volume levels which is also a great thing. The LED display from the Pulse 3 is adjustable and cycles through different colors depending on your settings – our only quibble is that sometimes the LED light does not change to the beat of the music. That being said, it’s still a visually stunning experience just looking at the Pulse 3 while listening to music – it looks almost like a beautiful lava lamp. The Verdict? The JBL Pulse 3 is among the best wireless Bluetooth speakers available that delivers incredibly smooth sound performance with a visually stunning LED design. It’s a 360 degree omni-direcitonal speaker with a full IPX7 waterproof rating and a 12 hour battery life that delivers on expectations. The JBL Connect+ app is also useful for adjusting the EQ settings or connecting multiple speakers together for a wider soundstage. The JBL Flip 4 is one of the best wireless Bluetooth speakers for outdoor enthusiasts and is one of our personal favorites. The speaker is designed to be compact and offers a full IPX7 waterproof resistance rating which means that you can take it outdoors or by the pool without any issues. The speaker delivers really crisp stereo sound with great volume levels and pretty deep bass response – enhanced by its dual bass radiators at the sides. The speaker allows you to connect up to 2 smartphones or tablet devices and take turns playing stereo sound. It comes with a built-in 3000mAh rechargeable battery that supports up to 12 hours of continuous music playtime. You can also submerge the JBL Flip 4 underwater without any issues. We liked the fact that you can also download the JBL Connect+ app which allows you to connect more than 100 JBL speakers together for a much wider soundstage. We loved the powerful stereo sound performance on this speaker and you can even crank it up to maximum volume without getting any distortion. It also has two durable strings at the top of the speaker which allow you to tie them to your backpack or bicycle on the go. It’s one the best wireless Bluetooth speakers that you can take around with you with an all-purpose design. We were quite surprised at how good the JBL Flip 4 sounded during our tests. The sound quality is crisp, clear and very well-defined with lots of midrange and bass. The timbre ranges on the Flip 4 sounded crisp and you really get good vocal performances from the Flip 4. We also liked the fact that it comes with dual external passive radiators which enhance the overall bass response – the dual radiators at the side vibrate together with the sound like bass drums. The battery life on this speaker is really good and can last for up to 12 hours of continuous music playtime on a single charge at 50% volume. The sound quality that we got from the Flip 4 is full-range sound and it covers the entire audio spectrum really well from 70 Hz to 20 kHz. Despite the speaker’s small and portable size, the bass output is pretty deep and punches very low. Bass music genres such as electronic dance music or rock sounded right off the bat punchy and crisp. We also liked the JBL Connect+ app function which allows you to pair the JBL Flip 4 with other speakers to create a much wider stereo soundstage. The speaker also connects up to 2 smartphone connections and you can switch between them simultaneously. The Verdict? The JBL Flip 4 is one of the best wireless Bluetooth speakers that comes in a fully portable design with really good sound performance. Despite its small and compact size, the JBL Flip 4 can produce a tremendous amount of volume and deliver really crisp vocals and deep bass. The bass performance hits hard and the dual passive bass radiators help to enhance the overall midrange and low frequency ranges. 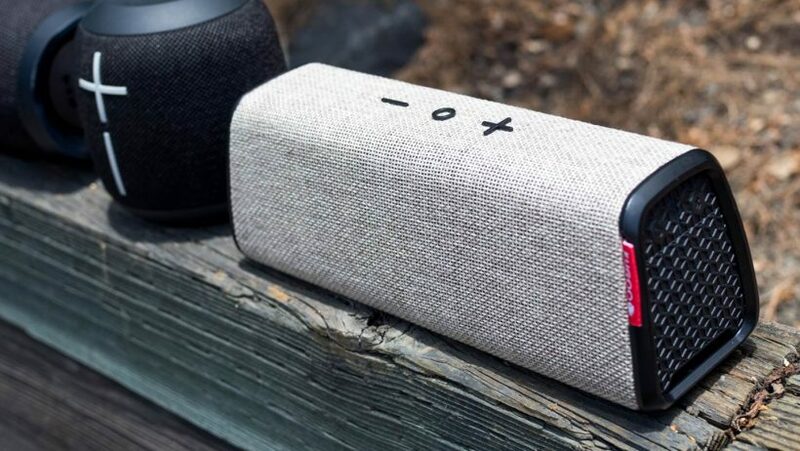 The speaker has an IPX7 waterproof durable build with voice assistant integration – it also comes in multiple colors to choose from which is a definitely added plus. If you are looking for a compact wireless Bluetooth speaker with crisp sound quality and a durable design, the Flip 4 comes highly recommended. The UE Wonderboom is one of the best wireless Bluetooth speakers that produces surprisingly good sound quality and even floats on water. It is a really compact portable speaker that has the height of a tin can but looks really sleek. It can produce up to 86dB of volume with a wide frequency range from 80 Hz to 20 kHz which is really outstanding for a speaker of this speaker. Furthermore, the speaker comes with a built-in battery that delivers up to 10 hours of continuous music playtime on a single charge. 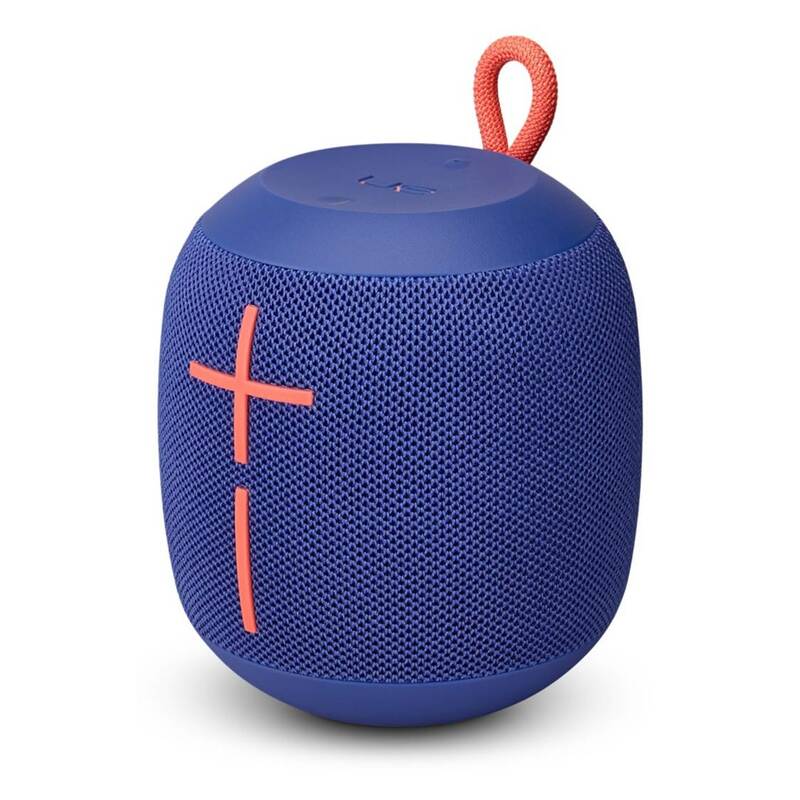 The UE Wonderboom delivers really crisp 360 degree sound with nice punchy beats and clear vocal performances – its fully IPX7 waterproof and is perfect for pool use. The wireless Bluetooth works up to 100 feet away and the wireless music streaming is clear and consistent. We also liked the fact that you can connect multiple Wonderboom speakers together to create a wider stereo soundstage and listening area. If you are looking for a smaller and compact speaker that can pump out tremendous amounts of volume, the UE Wonderboom may be your best bet. The sound quality of the UE Wonderboom is really impressive considering its size. We got clear vocals, detailed midranges and nice highs that sound smooth without any harshness. We were pretty surprised at how much lower-midrange tones and bass this speaker produced – it adds a layer of depth and complexity to the music. Although the bass does not hit as hard as the JBL Xtreme speaker or a boombox, it definitely adds a punch to the music and gives it plenty of depth. The sound from the UE Wonderboom is omni-directional and covers a good range with nice sonic dispersion – you can place it in the middle of the room to fill up the entire room with music. The buttons on the UE Wonderboom are tactile and low profile which makes them easy to press and unobtrusive. The design of the speaker itself is excellent and eye-catchy – with very durable IPX7 mesh coating and the plus minus volume buttons neatly located at the front of the speaker. In addition, the speaker is portable enough to be tossed into a backpack or strapped to your bag for convenience. Overall, the sound quality and volume that comes from the UE Wonderboom (up to 86dB of power) is definitely something to be reckoned with for a compact speaker of this size. The Verdict? If you are looking for one of the best wireless Bluetooth speakers with a compact IPX7 design and full-range sound, the UE Wonderboom speaker will not disappoint. It delivers really crisp full-range sound quality with plenty of volume and virtually no distortion at high volume levels. The design of the speaker is sleek, compact and eye-catchy with low-profile tactile buttons. The DOSS Touch is one of the best wireless Bluetooth speakers that delivers full-bodied 12W stereo sound. It is one of the best sounding Bluetooth speakers we have tested that come with capacitive touch controls that allow you to control the mood and your soundtracks at the touch of your fingertips. The speaker can pump out full-range stereo sound with crisp highs, detailed midranges and decent bass output – the level of volume that you get out from the DOSS Touch speaker is pretty impressive. The DOSS speaker comes equipped with Bluetooth 4.0 and is compatible with virtually all Bluetooth-enabled devices with NFC pairing to connect to the last device used. The DOSS Touch comes with dual high-performance drivers and a unique bass enhancement port which delivers deep sound response. We also liked the fact that the DOSS Touch comes with a built-in 2200mAh rechargeable battery that guarantees up to 12 hours of continuous music playtime at 75% volume. It also recharges in 3-4 hours with the included micro USB cable. If you are looking for a fuss-free wireless Bluetooth speaker that can deliver full-range stereo sound performance, the DOSS Touch comes highly recommended. The sound performance of the DOSS Touch speaker is really good for a 12W compact speaker of this size. While it does not have the sound quality of a Bose SoundLink Mini, it does pump out pretty solid sound quality with great volume. You can play it at half the volume and it will easily fill up a medium sized room without any issues. We really liked how the DOSS Touch speaker is capable of delivering full-range sound quality with pretty deep bass and crisp vocals without any distortion at higher volumes. Vocal and instrumental performances sounded pristine and crystal clear without any artificial enhancement. The speaker itself allows connection via Bluetooth or the 3.5mm line-in jack audio connector, while incorporating a 32 GB micro-SD slot. The speaker also doubles as a hands-free speakerphone when paired with your smartphone device for hands free calls. The DOSS Touch speaker has a classy design and a smooth matte finish that looks nice and solid. The touch controls on the top are for playback, and call control, while the central LED ring is for volume control and can be adjusted by sliding your finger clockwise. For music lovers, the DOSS Touch is a fuss-free speaker that really gets the job done. The Verdict? The DOSS Touch is one of the best wireless Bluetooth speakers that delivers full bodied 12W stereo sound. It has crisp highs, nice and clear midranges with decent lows and bass impact. It is one of the best sounding Bluetooth speakers with crisp sound quality and undistorted volume levels, and can easily fill up a room with full-range sound. The touch controls at the top are intuitive to use and the LED volume lighting also gives it a sleek all-round appearance. It’s essentially a fuss-free wireless Bluetooth speaker that delivers great value and we highly recommend them. The UE Roll is one of the best wireless Bluetooth speakers that can deliver up to 85dB of sound output with a wide frequency response between 108 Hz to 20kHz. It is a really sleek and modern looking speaker that is built primarily for outdoor activities and features a fully durable IPX7 waterproof construction – this means that the speaker can be fully immersed in water to a depth of 1m for up to 30 minutes without any issues. The speaker comes with a single 2” driver and two tweeters for crisp highs and detailed sound reproduction. The UE Roll has a unique pint-size design which makes it very portable and nice to carry around; it can be easily attached to a backpack or held in hand with the attachable marine-grade bungee cord. The speaker is designed to produce 360 degree surround sound with deep bass that hits hard, with crisp vocals and nice midranges. It also comes with a 9 hours battery life and 65 feet wireless range with wireless Bluetooth connectivity and can connect to virtually any Bluetooth enabled device. The UE Roll also comes with a companion app that provides firmware updates for better sound quality. It’s one of the best wireless Bluetooth speakers that comes with a unique and lightweight design with great sound and we highly recommend them. We were surprised at how good the sound performance from the UE Roll speaker was considering its compact and pint-shape design. The sound quality from the UE Roll is incredibly crisp and detailed and delivers full-range sound – the vocals are sharp with nice timbre ranges and the lower-midrange frequencies are present. The sound coming from the UE Roll feels deep and solid with plenty of depth, and not the muddy kind of sound quality that you would expect from an average Bluetooth speaker. The bass performance hits hard and punches quite deep – while not as deep as the JBL Flip 4 – it does add a layer of punch to the music beats. We would describe the sound signature of the UE Roll speaker as more warm and leaning towards the lower-midrange frequencies. As a result, the level of bass output that you get is considerably enhanced. At higher volumes, the UE Roll speaker remains clean and concise without any distortion – the 360 degree sound helps to disperse the sound and create a much wider soundstage. The battery life on this speaker lasts for a good 9 hours of continuous music playtime and the Bluetooth connectivity is consistent without any dips in sound quality. Our only quibble is that the UE Roll takes approximately 5.5 hours to charge via the micro USB cable which is kind of long. The Verdict? The UE Roll is one of the best wireless Bluetooth speakers for those looking for 360 degree surround sound in a compact and sleek package. The speaker itself has a unique and pint-shape design that looks very eye-catchy and comes in stunning patterns to choose from. It is a durable speaker and has a rubberized mesh exterior that protects it from water and outdoor elements – the speaker is IPX7 rated and can be fully immersed underwater to a depth of 1m. The sound performance of the UE Roll is surprisingly good, with plenty of volume, crisp vocals and decent bass output. The attachable marine-grade bungee cord that comes with the speaker is definitely an added plus. 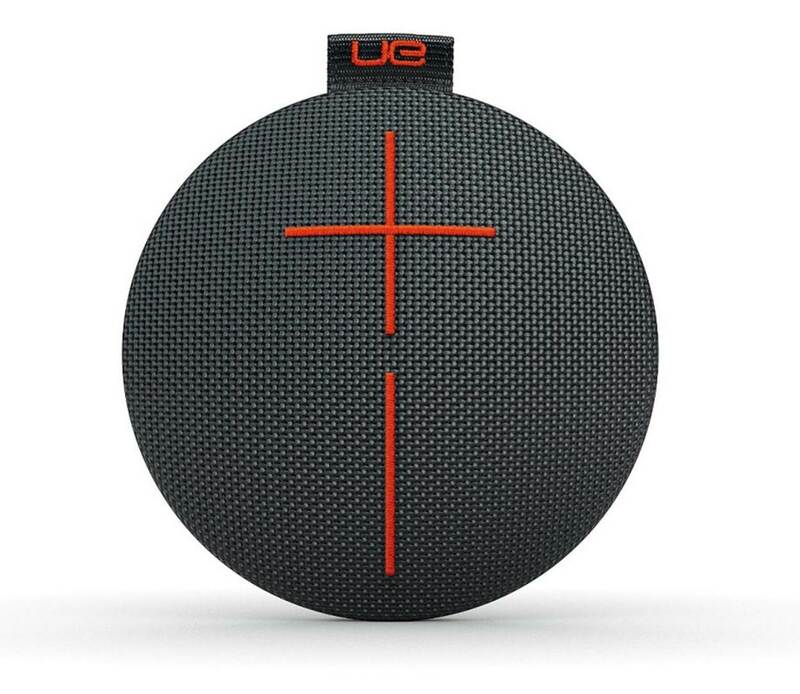 Overall, the UE Roll is really solid speaker for outdoor adventurers and is worth checking out. The JBL Xtreme is one of the best wireless Bluetooth speakers we have tested and it is a monster of a speaker that can pump out up to 40 watts (20W x 2) of power with up to 15 hours of playtime. The speaker comes equipped with a massive 10,000mAh rechargeable battery that can deliver superb sound performance and even double as a power bank for other mobile devices. The speaker produces a tonne of volume and deep bass output with its dual external passive radiators at both sides of the speaker. You can literally feel the entire room shaking with these speakers turned up to maximum volume and the speakers do not distort at all. 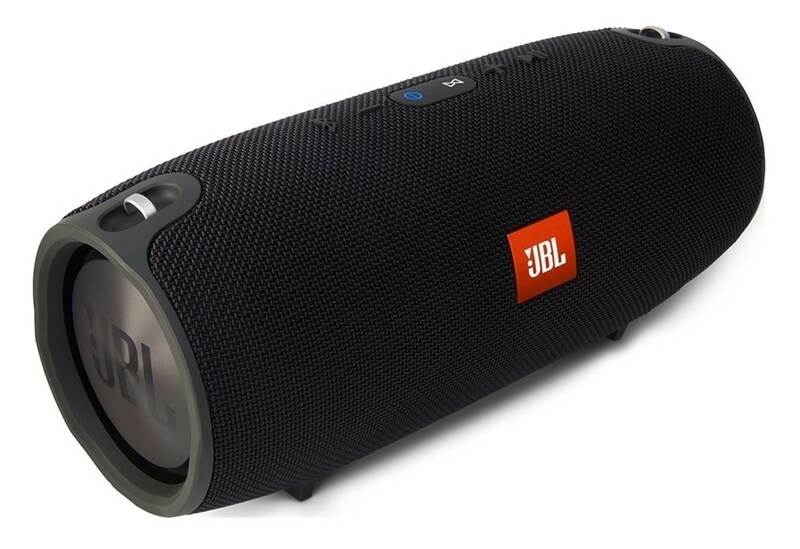 The bass that the JBL Xtreme produces is deep and solid enough to rock the entire room – the bass goes really deep and adds plenty of punch to disco music and bass-heavy genres such as electronic dance music. Apart from its superb sound performance, the JBL Xtreme comes with a splashproof design which makes it resistant to rain or splashes of water. It also allows you to crystal clear calls from the speaker with a built-in noise cancelling speakerphone. 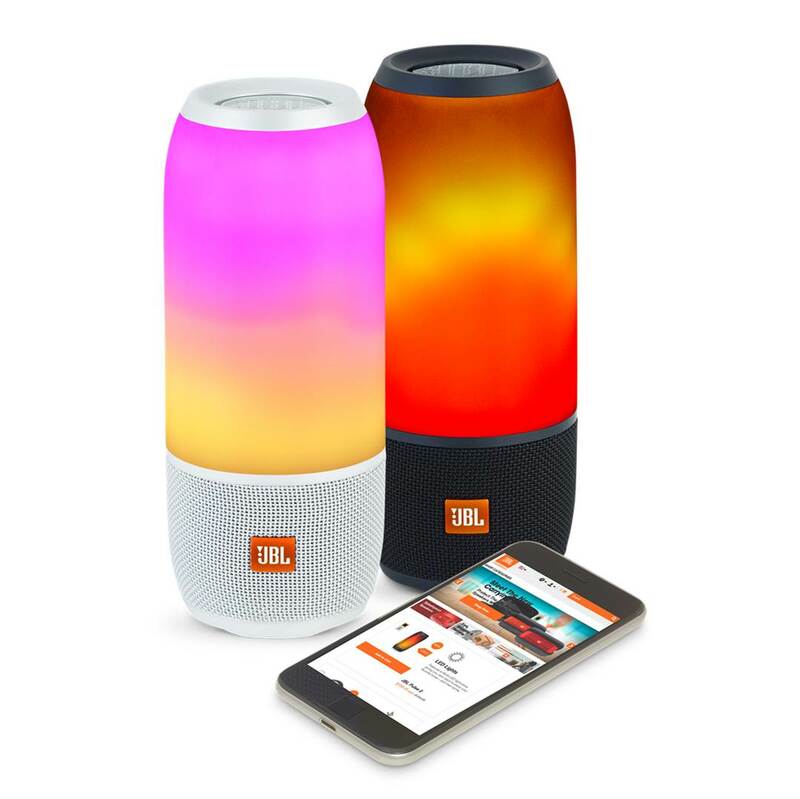 The JBL Xtreme allows you to connect up to 3 smartphones or tablet devices to the speaker at the same time. Overall, the JBL Xtreme is one of the best wireless Bluetooth speakers that is built for performance and we highly recommend them. The sound performance that we got from the JBL Xtreme is in one word – massive. The amount of volume that you can get out of this speaker is plainly staggering and the loudness and level of clarity in the music is quite incredible. The speaker pumps out crystal clear stereo sound performance and you can hear the stereo separation between the right and left speaker channels. It also provides a good deal of soundstage and you can even start to pick up details in the music which you might not have heard before. Furthermore, you can also download the JBL Connect+ app and connect multiple JBL Xtreme speakers together for a much wider sound-field. We found that the JBL Xtreme has a fair amount of bass boost that amplifies the lower-midrange and bass frequency ranges – this makes bass music genres such as pop and rock sound particularly good with these speakers. They are perfect for disco or poolside parties where you can blast sound freely without having to worry about disturbing the neighbors. 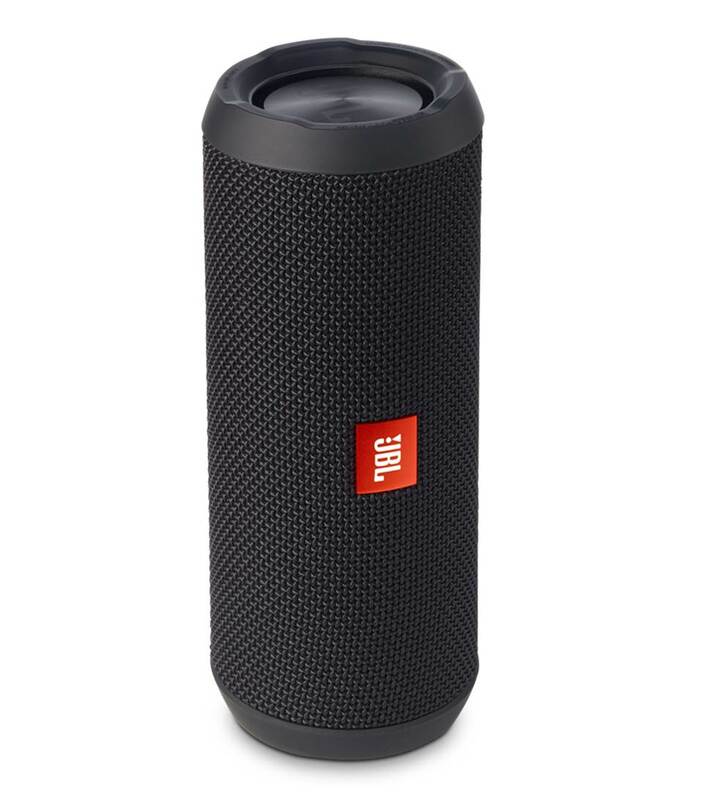 The JBL Xtreme speaker is also fairly responsive to EQ changes and you can tune the sound settings to suit your listening appetite depending on your sound preferences. The Verdict? The JBL Xtreme is truly a mammoth speaker and one of the best wireless Bluetooth speakers built for heavy music listeners. The speaker can produce plenty of volume and bass, and fill up a large area with rich and dynamic sound quality. The battery life on this speaker lasts a whopping 15 hours of playtime with a 10,000mAh capacity and is ideal for poolside parties or gatherings. The speaker also has a durable design with water-resistant coating and looks eye-catchy and sleek. The Marshall Stanmore is one of the best wireless Bluetooth speakers with a classy vintage designand very few cons to speak about. The Marshall Stanmore comes with classic Marshall design details and produces very crisp and clean sound performance with deep bass. 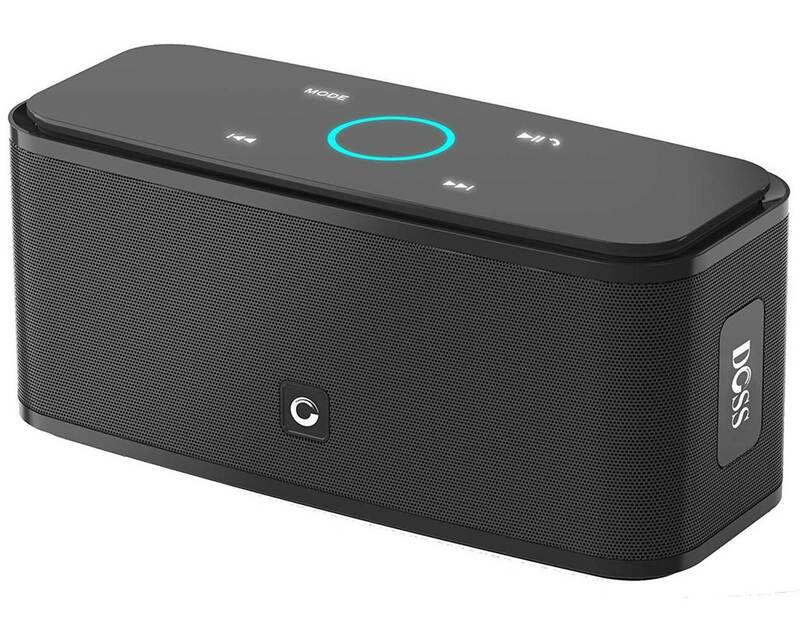 Apart from wireless Bluetooth music streaming, the speaker features a 3.5mm input and double ended cable in the box for phono connections. The level of clarity and sound performance that you get from the Stanmore is superb – it has distinctive and precise vocals and really good stereo soundstage that makes you feel as though you are standing in front of the artist. The level of separation that you get is accurate and distinct, and you can tell where each instrumental note is coming from. The bass from the speaker also hits hard and feels very deep – it adds a good layer of texture to the overall sound performance. It also delivers a tonne of volume and you can practically fill up your entire room with rich sound with just 50% volume – you can also blast music outdoors with this speaker. We especially loved the vintage treble and bass knobs that have a really sleek feel to them – the overall design makes this a unique classic speaker that stands out from the crowd. Where the Marshall Stanmore stands out is in the level of clarity and tonal precision that you get with these speakers. Music performances sound almost life-like and incredibly detailed; the treble ranges are sweet and the timbre is nicely defined. The midrange on the Stanmore speaker can be heard audibly and the bass hits hard and goes deep. It also has very nice adjustable treble and bass knobs – the bass can be adjusted up to maximum but we found that it starts to muddy at very loud volumes. That being said, the vocal performances are crisp and pristine, with very little harshness in the treble ranges. We liked the fact that the Stanmore speaker comes with a coiled, kink-free double ended stereo cable with two 3.5mm plugs for versatility. The wireless Bluetooth connectivity works like a charm and we did not experience any dips in sound quality while streaming from Bluetooth devices. The speaker also has RCA inputs which allow you to connect to CD players or turntables and enjoy classical music genres. It’s a speaker that really delivers classic Marshall quality and the sound performance and volume makes it a real contender for the top spot. The Verdict? 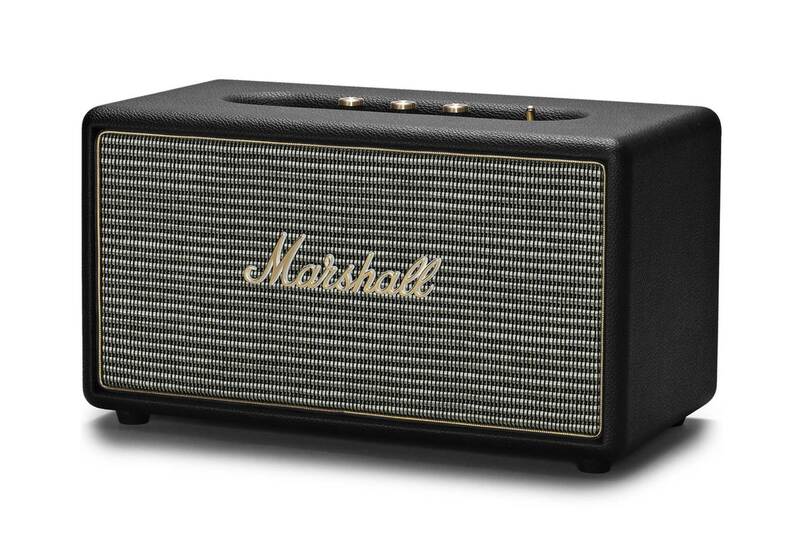 The Marshall Stanmore is one of the best wireless Bluetooth speakers for those into vintage classic speaker designs. It features very refined treble and bass knobs, with a full leatherette casing that gives it a classy and vintage feel. You can tell that the manufacturers really put in a lot of effort into getting the design of the speaker right. Furthermore, the level of clarity and detail that we got from this speaker is of high quality – music performances sounded almost lifelike and the speaker has plenty of volume to spare. Our only quibble is that the bass may start to muddy out at maximum volume settings, but apart from this, it’s a wireless Bluetooth speaker that delivers above expectations and is worth checking out. 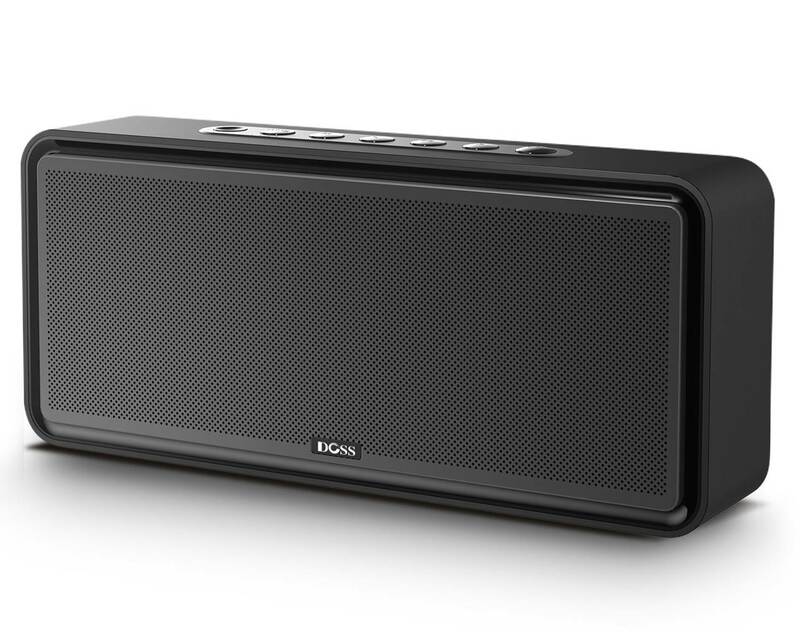 The DOSS SoundBox XL is one of the best wireless Bluetooth speakers that deliver high quality stereo sound – it’s a speaker that focuses on performance and deep bass response. The speaker comes with a powerful 20W driver with DSP technology for crystal clear audio performance and rich bass – the midranges and highs are well-defined and very smooth. We were quite surprised at how expansive the sound from the DOSS speaker was – it sounded as though we were listening to a high-end stereo speaker system. The speaker also comes equipped with a dual passive radiators and a 12W built-in subwoofer for enhanced bass reproduction – you get really strong lows with plenty of depth without any distortion. The DOSS SoundBox XL comes with Bluetooth 4.0 and has a wireless range of up to 33 feet, and is compatible with virtually any Bluetooth enable device. It also supports auxiliary-in, TF card and Echo Dot. We liked the fact that the SoundBox XL features a built-in 2200mAh rechargeable battery that delivers up to 10 hours of continuous playtime at 50% volume, and takes approximately 3-4 hours to recharge. On the whole, the DOSS SoundBox XL is one of the best sounding wireless Bluetooth speakers we have heard and definitely recommend them. The sound performance of the DOSS SoundBox XL sounds more spacious and wide than it actually is. This speaker literally punches above its weight and the level of stereo clarity that we got is comparable to higher-end speakers. The bass from the SoundBox hits hard and goes very deep – it makes electronic dance music and rock and pop genres sound extremely lively and punchy. Furthermore, it is able to distinguish between lower-midrange and low bass notes which makes the music even more refined. The built-in subwoofer is capable of playing bass notes down to 20 Hz and it delivers a pretty wide soundstage. Vocal performances sound crystal clear on the SoundBox and the level of stereo separation that you get with the speaker is hands down outstanding. The highs and midranges on this speaker are crisp and clear, with very smooth timbre ranges that do not sound harsh or distort at maximum volume levels. We would say that the sound quality from the DOSS SoundBox XL even surpasses that of the JBL Flip 4 and UE Boom 2 speakers in terms of bass depth and midrange clarity. The Verdict? If you are looking for a high performance best sounding Bluetotoh speaker, the DOSS SoundBox XL is undoubtedly the one you should get. It is a high performance stereo speaker with 20W drivers and a 12W subwoofer to give a combined sound output of 32W. It also features Bluetooth 4.0 and auxiliary input connections for non-wireless music sources. We were highly impressed by how good this speaker sounded compared to more expensive brands. Our only quibble is that the SoundBox XL has a more ‘plastic’ feel compared to other speakers – but beats the competition hands down in terms of sound quality. The sound quality from the Aomais Life Bluetooth speaker is crisp, full and very detailed. The stereo sound output from the speaker is really good and it can pump out a massive 30Ws of sound – it is loud enough to fill up a large room with rich sound with deep bass. The stereo separation is clear and distinct and you can hear each individual note coming from the left or right speaker channels. 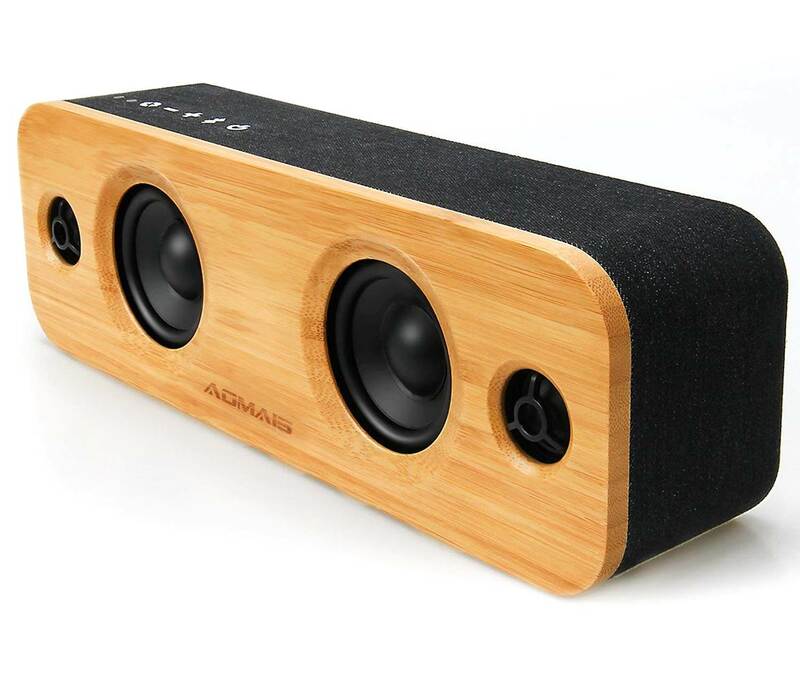 The bass on the Aomais Life speaker hits hard and goes very deep – bass-heavy music genres such as electronic dance music and rock and pop sound very punchy with a nice lower-midrange frequency response. Instrumental music sounded very refined with plenty of soundstage – it feels almost as though you are listening to a higher-end stereo system with these speakers. We liked the fact that you can really crank up the volume on the Aomais Life speaker without getting any distortion – the sound remains smooth and consistent throughout high volume levels. The Aomais Life also comes with 3EQ mode settings which you can use to adjust the sound output according to your individual preferences. The wireless Bluetooth connectivity works like a charm and has a 66 feet distance range. It’s a great speaker to have at home and it blends in nicely with modern home interior décor. The Verdict? The Aomais Life is one of the best wireless Bluetooth speakers that have a full 30 watts of output power and enough volume to fill up your home with rich full-range sound. The bass performance on the speaker is enhanced by its dual passive subwoofer drivers and delivers deep punchy midranges and lows. Vocal performances are crisp and clear and this speaker can really bring out the best in music recordings with good soundstage. It also produces detailed separation between the right and left speaker channels. The 3EQ mode adjustments are a definite added plus and you can tweak the sound settings according to your preferences. It’s one of the best sounding Bluetooth speakers made of natural bamboo wood and a great conversational piece to have at home. 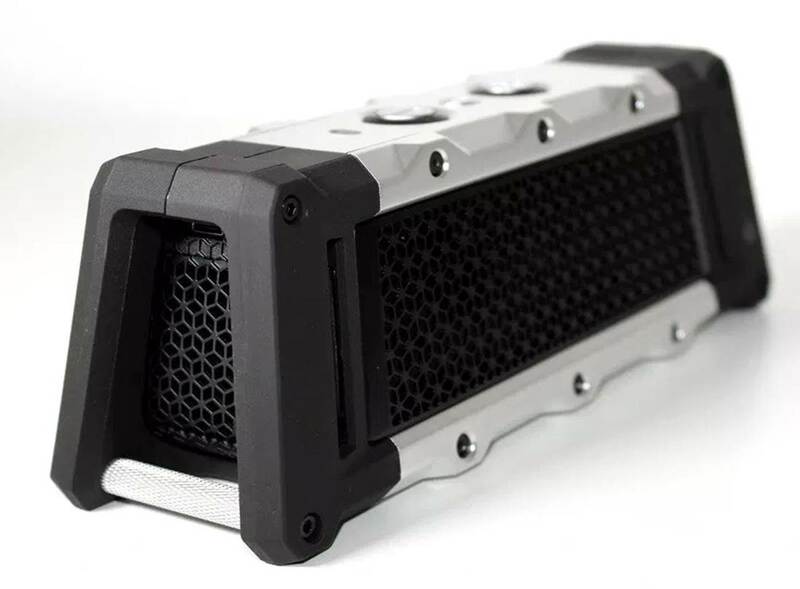 The FUGOO Tough is one of the best wireless Bluetooth speakers available that can deliver 360 degree sound quality with a tough and rugged waterproof construction. The FUGOO Tough is built and designed like a tank with 100% waterproof, mud-proof, snow-proof and shock-proof design and is the perfect speaker to take outdoors. The FUGOO Tough speaker can produce a tremendous amount volume with six drivers on four sides with a 360 degree sweet spot and a 95dB SPL-A volume. It consists of two tweeters, two woofers, and two passive radiators for deep bass and full-range sound reproduction. It also comes with a whooping battery life of 40 hours of continuous music playtime and a built-in microphone for full-duplex speakerphone capability with Siri and Google Now compatibility. The FUGOO Tough is crafted from fiber-reinforced resin and solid aluminium and has a 100% waterproof rating with an IP67 protection rating – this means that you can immerse it in water up to a depth of 1m for 30 minutes without any issues. Furthermore, the FUGOO Tough speakers are tilted upwards at an 8 degree angle to ensure that you get good sound projection. If you are looking for some of the best wireless Bluetooth speakers that excel in terms of durability, the FUGOO Touch is the one to go for. The sound performance of the FUGOO Tough is surprisingly good considering how protected the speaker is. The sound coming from the speaker has great tonal balance and delivers really nice highs and detailed midranges. The bass from the FUGOO Tough is decent and you can also place the speaker at the corner of the room to reinforce the bass response. The amount of volume that the FUGOO Tough can produce is staggering – at 70% volume it can easily fill up an entire room with loud music and produce very good soundstage. The sound quality that we got from this speaker is full-range and it is comparable to other pretty high-end wireless Bluetooth speakers that we tested. Compared to a Boombox speaker, the FUGOO Tough may not produce as much volume but it does outweigh other speakers in terms of battery life. It comes with a huge battery tank that supports up to 40 hours of continuous music playtime and you can really crank up the volume on this speaker without having to worry about it snapping off. Bass-heavy music genres such as electronic dance music and rock and pop sound pretty punchy off the bat. Our only quibble is that the timbre ranges sound a little mellow – otherwise the FUGOO Tough delivers superb sound quality with really decent midranges. The Verdict? The FUGOO Tough is one of the best wireless Bluetooth speakers we have tested that delivers excellent sound performance and a fully protected design. The entire speaker is IP67 waterproof which means that it can be submerged underwater without any issues up to a depth of 1 meter. Furthermore, the entire speaker is protected by a rubberized and metallic exterior that makes it impervious to outdoor elements. It’s a speaker that is built like a tank and is suitable for extreme outdoor use while boasting a battery life of 40 hours. Overall, it’s one of the best wireless Bluetooth speakers with the toughest design we ever seen and we highly recommend them. The OontZ Angle 3 is one of the best wireless Bluetooth speakers capable of producing crystal clear stereo sound with two precision acoustic drivers. The speaker can produce distinct highs and midranges with enhanced bass performance from its proprietary passive bass radiator design. The Angle 3 speaker is designed to deliver louder volume and more bass without any distortion at high volume levels, and the wireless Bluetooth works to stream music from Spotify, iTunes and other smartphone devices. The entire speaker has a relatively compact design and is only 5” long and 2.8” high, and weighs under 10 ounces. It also has a high capacity rechargeable 2200mAH battery that can provide up to 12 hours of continuous music playtime at 2/3 volume on a full charge. The OnntZ Angle 3 is designed to be comfortable to carry with no square edges and can fit into your backpack easily, which makes it ideal for travelling or hiking. We also liked the fact that the speaker is IPX5 splash-proof, dustproof, sandproof and can survive splashes of water – which makes it suitable for use beside the pool or under rain. It comes with an included 3.5mm auxiliary input jack for connection to non-wireless music sources and has a built-in microphone for hands-free speakerphone calls. Overall, it’s one of the best wireless Bluetooth speakers available and we highly recommend them. The sound quality on the OontZ Angle 3 is much better than expected from a speaker of such a small and compact size. It comes with two precision neodymium drivers that deliver crisp highs and clear midranges, with a bass radiator that delivers enhanced bass performance. It has an output peak power of 10 watts and can fill up a room with rich sound at maximum volume without any distortion. The OontZ Angle 3 packs a tonne of bass for such a compact speaker and you can really hear the deep lows from the speaker and lower-midrange frequencies. Bass-heavy music genres such as electronic dance music and rock sound pretty good from the speaker. While it’s not the loudest speaker we have tested, the level of sound quality that you get from the precision drivers makes this speaker worth considering. The stereo sound performance and vocal clarity is also apparent when we first tested the speaker – the highs are clean and refined without any harshness. In short, the sound performance of the OontZ Angle 3 is surpasses that of other similar sized speakers and you can expect to hear very clean and detailed music performances from this Bluetooth speaker without any distortion at high volume levels. The Verdict? 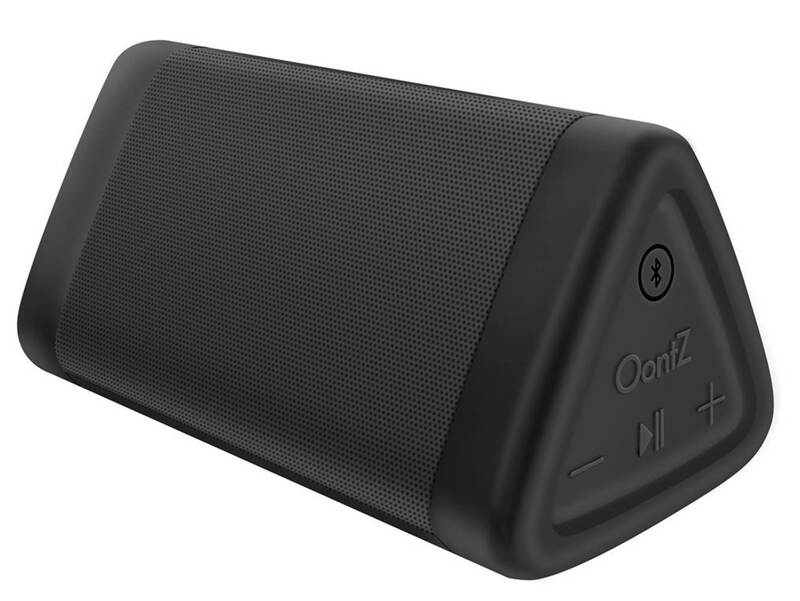 At its best, the OontZ Angle 3 demonstrates what an excellent wireless Bluetooth speaker should be – portable, compact and capable of delivering great sound. The two precision drivers can pump out 10W of crystal clear distortion-free sound at high volume levels without any issues. It is also designed to be IPX5 water-resistant and is rainproof and showerproof – it is designed to be resistant to outdoor elements and works well for travelling or pool parties. Furthermore, it comes with a stylish design that can be angled horizontally or vertically depending on your listening preferences. It also comes with a 3.5mm auxiliary input for non-wireless music sources and connects quickly over Bluetooth to iPhone, smartphone and tablet devices. We liked the fact that it also comes with a 2200mAh battery that can deliver up to 12 hours of continuous music playtime on a full charge at 50% volume. Overall, it’s one of the best wireless Bluetooth speakers that delivers great sound in a small package and we highly recommend them. The Anker SoundCore Boost is one of the best wireless Bluetooth speakers that can deliver 20Ws of great stereo sound quality with nice volume levels. The speaker comes with Anker Bass-Up technology which allows you to boost the lower-midranges and bass response at a push of a button for bass-heavy music genres. The speaker also comes with dual drivers and twin subwoofers that pump of 20W of powerful high-fidelity audio performance and room-filling sound, making it suitable for disco parties and music listening. It also has a built-in battery that delivers up to 12 hours of continuous music playtime on a single charge and comes enabled with Bluetooth 4.2 and NFC instant pairing for convenience. This Bluetooth speaker also comes with a built-in microphone that allows you to take hands free calls on the go. To top it off, the Anker SoundCore has a portable design with IPX5 water-resistance which makes it impervious to rain and splashes of water. The entire package comes with the Anker SoundCore speaker, micro USB charging cable and user manual for easy reference. If you are looking for one of the best wireless Bluetooth speakers that can produce 20W of superb stereo sound quality, the Anker SoundCore comes highly recommended. 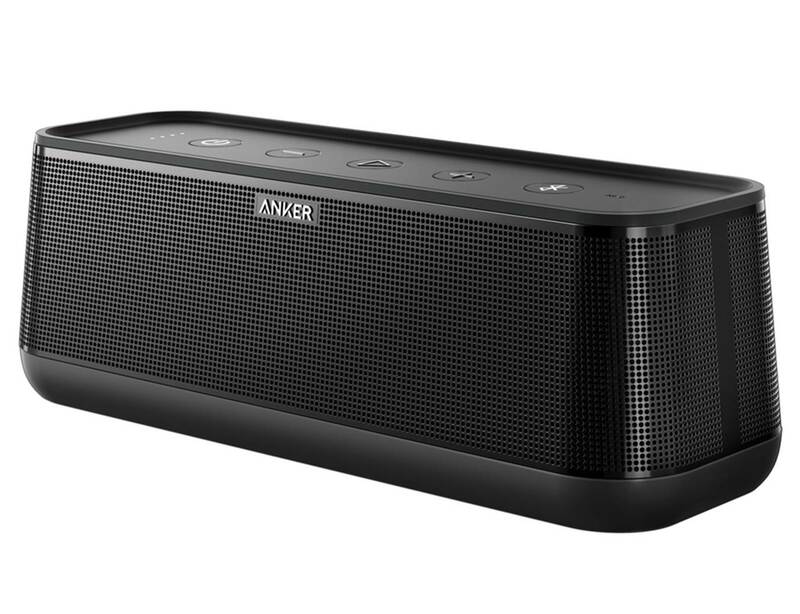 The sound performance of the Anker SoundCore is exceptionally good and goes very loud with a tonne of bass performance. The sound quality of this speaker feels crisp, refined and detailed without any hint of muddiness. It can deliver really good soundstage with very nice stereo separation – vocal performances feel lifelike and very smooth, and you can hear the vocal and instrumental notes clearly and with a good sense of direction. Music genres such as classical folk music and country rock sounded very smooth and felt as though we were listening to a much larger stereo system. We also enjoyed electronic dance music genres which had plenty of punch and deep bass to go with it – the sound feels rich and full-range, and the SoundCore gets the frequency ranges right. There is no muddiness in the sound and you can feel that the speaker distinguishes between every note and frequency with great precision. We also liked the bass boost function – it can boost up the bass frequency ranges while maintaining a warmer sound signature and the bass does not muddy into the midrange frequencies. It gives the impression that you are listening to speakers with a dedicated subwoofer. 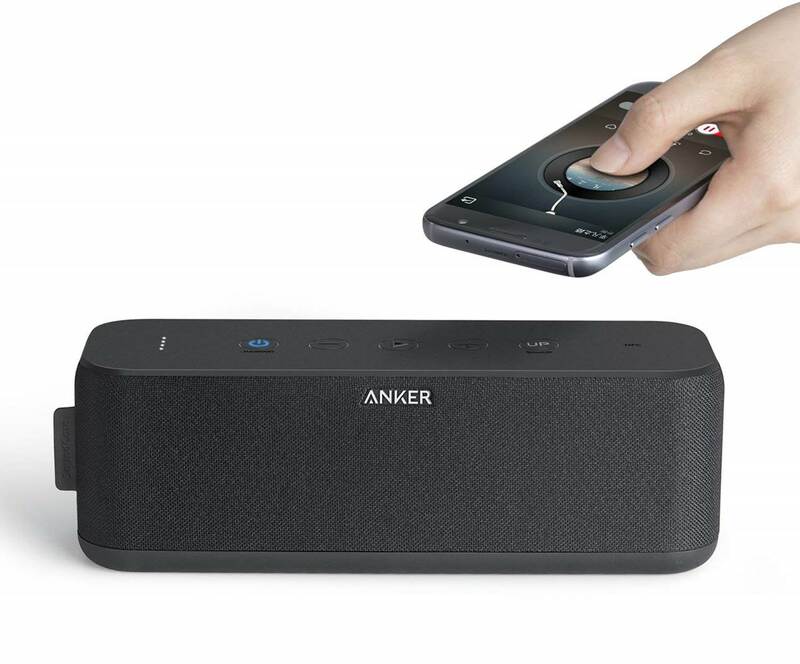 On the whole, the Anker SoundCore is a high quality Bluetooth speaker that can satisfy demanding listeners without being too expensive and deliver crystal clear 20W stereo sound performance. The Verdict? The Anker SoundCore Boost is one of the best wireless Bluetooth speakers that can deliver up to 20W of pure stereo sound quality. It can produce great volume levels and stereo separation without any distortion, and sounds comparable to higher-end Bluetooth speakers we have tested. The speaker also comes with a unique bass boost function that boosts the lower frequency ranges without sounding muddy or harsh – you get really clean and crisp sound performance from this wireless speaker. The level of stereo separation from the dual high-performance drivers is also pretty impressive, and it is boosted by twin passive subwoofers that help to enhance the lower-midrange frequencies. We particularly liked the fact that it comes with a 5200mAh battery that can provide up to 12 hours of continuous music playtime on a full charge, and the Bluetooth 4.2 has a good distance of up to 66 feet. It’s also IPX5 water-resistant which means that it can be brought outdoors and exposed to splashes of water or rain without any issues. It’s one of the best wireless Bluetooth speakers with a portable design that delivers great stereo sound performance and we highly recommend them. The Bose SoundLink Micro is one of the best wireless Bluetooth speakers that delivers rich and clear sound from a very compact setup. The SoundLink micro is a speaker that is built for travel and portability, and has a durable tear-resistant silicone strap which you can use to strap the speaker to your backpack. The speaker is capable of delivering crisp balanced sound performance with deep bass, and sounds loud and clear in outdoor open spaces. The entire speaker is designed to be waterproof with an IPX7 rating with a soft rugged exterior that resists dents and scratches. We liked the fact that the speaker has a built-in speakerphone for taking calls and allows you to access Siri or Google Assistant on the go. It also comes with a rechargeable battery that can deliver up to 6 hours of continuous music playtime on a single charge and the Bluetooth has a good range of up to 30 feet. The SoundLink Micro speaker also comes with a built-in speakerphone for you to take hands free calls and connect to Siri or Google Assistant. We liked the fact that the SoundLink Micro is very compact and has a dimension of 3.87” x 3.87” x 1.37” and is small enough to fit into a backpack. If you are looking for one of the best wireless Bluetooth speakers designed for great portable sound, the Bose SoundLink Micro is a great choice. The sound performance of the Bose SoundLink Micro is much better than expected from a speaker of this size. It produces loud and crystal clear sound that feels rich and somewhat full-range. The SoundLink Micro features proprietary Bose technology and comes with a custom-mounted transducer and passive radiators for great sound reproduction. It’s a speaker that sounds much bigger than it actually is and the level of bass that you get – while not the best we have heard – is pretty impressive for a speaker of this size and goes quite deep. The sound signature on the SoundLink Micro is somewhat flat in the midranges and leaning more towards the lower end – the highs and treble ranges are crisp and well-defined. The wireless Bluetooth connectivity on the SoundLink Micro works like a charm and has voice prompts which is pretty neat. 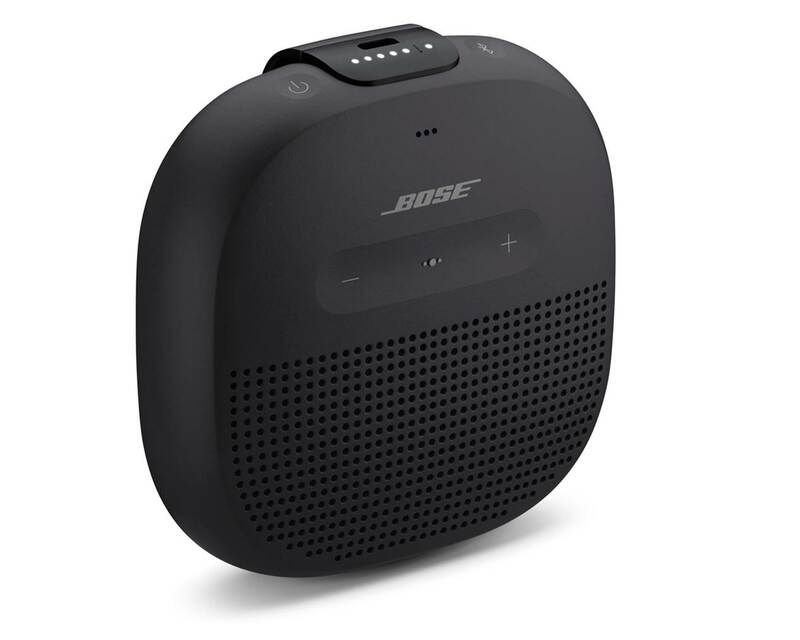 We also liked the fact that you can use the Bose Connect app to pair the SoundLink Micro with other compatible Bose speakers to create a much wider soundstage in your home or outdoor environment. Furthermore, the speaker is IPX7 waterproof and can be exposed to outdoor elements such as rain without any issues. The speaker can pump out really good sound performance for a full 6 hours on a full charge and you can even take calls on the speaker using the built-in speakerphone. The Verdict? The Bose SoundLink Micro is one of the best wireless Bluetooth speakers that can produce big sound from a small package. Although the speaker is designed to be small and compact, it can produce a respectable amount of volume and bass – the sound performance feels rich and full-range. The bass impact on the SoundLink Micro is present and hits hard. While it’s not the loudest speaker we have reviewed, it does punch above its weight for such a small-form speaker. The level of portability that you get with the SoundLink Micro is excellent – it also comes with a strap for you to attach it easily to your backpack for convenience. The entire speaker is IPX7 waterproof which gives it extra resistance to rain and splashes of water. The entire package comes with the Bose SoundLink Micro speaker together with a USB cable for charging. Overall, it’s one of the best wireless Bluetooth speakers designed for portability that punches above its weight with deep and rich sound performance. The Sony XB10 is one of the best wireless Bluetooth speakers with a miniature design that looks really sleek and cool. It is built to deliver crystal clear sound quality with extra bass – it comes with a built-in passive radiator which works with the internal speaker to enhance the low-end response and give a bass boost to the music performance. It also allows you to connect and stream music easily with Bluetooth and NFC one-touch pairing. The Sony XB10 mini is compatible with A2DP, AVRCP, HFP, HSP Bluetooth profiles and has a wireless range of up to 30 feet. We also liked the fact that the XB10 has a water-resistant design for outdoor listening and comes with a built-in battery that can deliver up to 16 hours of battery life. The Sony XB10 has a small and lightweight design and you can even pair two of the Sony XB10 speakers together to create a much wider sound-field. It’s one of the best wireless Bluetooth speakers we have tested that does deliver in terms of sound quality for such a small mini speaker and we highly recommend them. The Sony XB10 speaker delivers much more sound than you could expect from a mini speaker of this size. It has crisp highs, detailed midranges and nice bass – it can produce a surprising amount of volume despite its small size. We also liked the fact that you can pair two of these speakers together to create a wider stereo soundstage – both speakers sync together and you can control the music soundtracks and volume from a single device. The bass performance from the XB10 goes deep and has plenty of depth to it – it makes electronic dance music and rock and pop genres such really crisp and nice, although the bass starts to roll off at higher volume levels. That being said, the highs and timbre ranges remain smooth at maximum volume levels and vocal performances still come across as well-defined. The XB10 itself has a really durable design and there is a rubber gasket to cover the micro USB port and the audio in port to make it water-resistant. The entire speaker is IPX5 water-resistant which means that it can take splashes of water without any issues and is suitable for outdoor use. On the whole, we can safely say that the XB10 is one of the best sounding portable speakers to carry around and definitely adds a kick to music soundtracks. The Verdict? 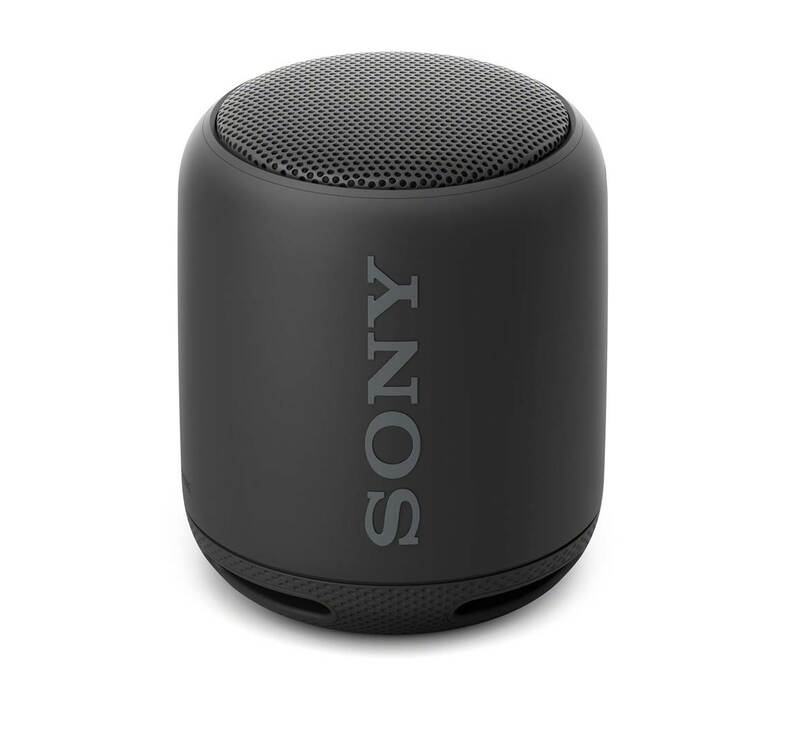 If you are looking for one of the best wireless Bluetooth speakers with a fully portable mini design, the Sony XB10 comes highly recommended. The level of sound clarity that you get from the XB10 surpasses expectations and vocal performances are reproduced with good clarity and detail. The midrange sound from the XB10 is decent and the bass sounds full and rich – although it might start to distort at maximum volumes. That being said, the XB10 pumps out way more volume that you would expect from a conventional mini Bluetooth speaker and you can even pair two XB10 speakers together to create a much wider stereo sound-field. The wireless Bluetooth connectivity on the Sony XB10 also works like a charm and is compatible with various Bluetooth profiles including A2DP and AVRCH. It’s one of the best wireless Bluetooth speakers that we have encountered that looks super sleek and delivers sound quality that surpasses expectations on what you can expect from a mini speaker. The Tribit XSound Go is one of the best wireless Bluetooth speakers that deliver an immersive listening experience with the versatility of a portable outdoor speaker. The speaker is capable of producing crystal clear highs, detailed midranges and deep bass performance. It comes with bass radiators and dual 6W drivers for crisp stereo sound – it has a total output power of 12W. The speaker itself looks pretty stylish and features curved edges with a matte finish for a modern touch. It is also designed to be compact and fully portable with a waterproof design that makes it suitable for beach or poolside use. The speaker also features a built-in battery that delivers up to 24 hours of continuous music playtime on a single charge which is a nice added touch. It uses Bluetooth 4.2 technology for high quality wireless music streaming with a range of up to 66 feet. We liked the solid construction of the XSound Go speaker and it has a tough exterior with a solid internal frame that protects against bumps and drops. Overall, the Tribit XSound Go is one of the best wireless Bluetooth speakers that can deliver clean 12W stereo sound with deep bass and we highly recommend them. 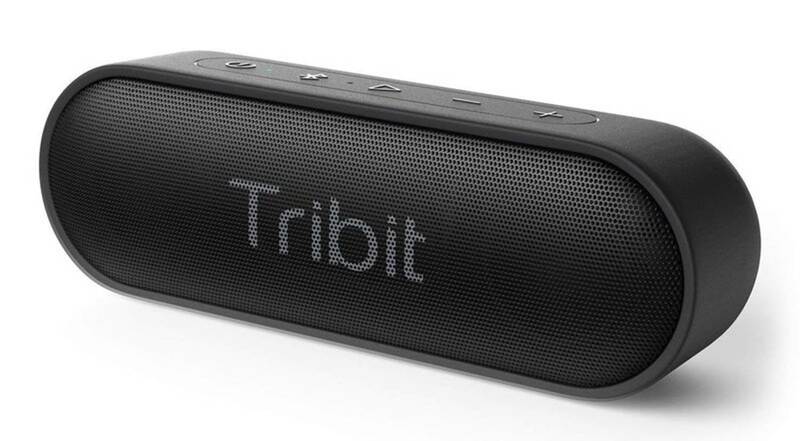 The sound quality of the Tribet XSound Go is pretty impressive for its size. The highs and midranges are accurate and detailed, with crisp vocal performances and good midrange. The bass response is not overwhelming or bloated and stays nicely where it should be. We also did not hear any distortion in sound quality at any volume level or high volume levels. The key advantage that the XSound Go speaker has over other Bluetooth speakers is that it has strong bass – the bass hits hard and adds an extra layer of punch to the music quality. In our view, the bass from the Tribet XSound Go is almost as good as the Bose Mini portable speaker which definitely speaks volumes about this speaker. We also liked the fact that you can blast the full 12W of volume from this speaker and it delivers rich and clean sound that can fill up a large room without any issues. Instrumental music sounded particularly clear on the Tribet XSound Go speaker and you can virtually pick up every single note in the sound with distinct clarity – it also provides some degree of spatial imaging which is pretty good. On the whole, the Tribet XSound Go is a speaker that has better sonic spectrum and battery performance compared to other wireless portable speakers in the same category. The Verdict? The Tribit XSound Go is one of our favorite wireless Bluetooth speakers that combines great sound performance with versatility. It is a compact speaker featuring dual 6W drivers that can pump out crystal clear stereo and a passive bass radiator that allows this speaker to emanate bass from every corner. We thoroughly enjoyed the highs, midranges and rich bass that the Tribit XSound speaker produced and the level of precision that it offers. We also liked the fact that the speaker comes with a high performance battery that delivers up to 24 hours of continuous music playtime on a single charge. Furthermore, the speaker is IPX7 waterproof which means that it can tolerate rain and splashes of water without any issues. The Tribit XSound Go also uses Bluetooth 4.2 technology which provides high quality music streaming and is compatible with virtually any Bluetooth enabled device. It’s one of the best wireless Bluetooth speakers that delivers really good full-range sound quality and we highly recommend them. 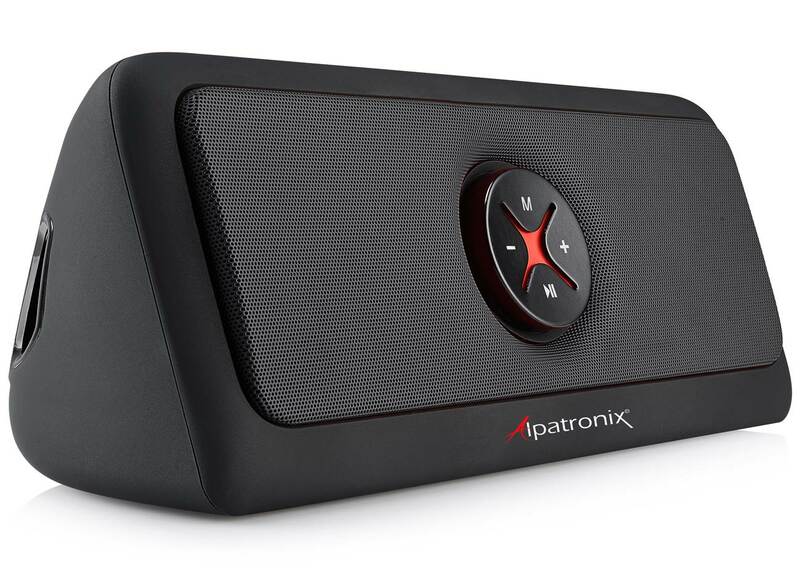 If you are looking for one of the best wireless Bluetooth speakers that can produce a tonne of volume, the Alpatronix AX440 comes highly recommended. It is a powerful speaker that can produce high-definition sound with an audio range of up to 30 feet. The speaker allows you to connect to your smartphone via Bluetooth, USB flash drive or auxiliary cable to play your favorite music soundtracks. It also has two passive subwoofers located on the right and left sides of the speaker to produce deep enhanced bass performance. The entire speaker is designed to be compact and lightweight and weighs only a mere 3 lbs, which makes it really portable and suitable for indoor or outdoor use. We liked the fact that the Alpatronix can pump out a full 30 watts of full-range sound quality and is powerful enough to fill up a large room with rich sound quality. It also comes with a long-lasting battery that has a 5400 mAh capacity that can provide more than 12 hours of continuous music playtime at 50% volume with 720 hours of standby time. The AX440 also has enough battery to double as a power bank to charge your smartphone devices via the included USB cable. Overall, the AX440 is one of the best wireless Bluetooth speakers available and is a great choice if you are looking for a high performance 30W speaker. The sound quality of the AX440 Bluetooth speaker is pretty amazing and gets really loud at maximum volume. The speaker delivers really crisp highs, nice timbre ranges and detailed midranges. The bass on the speaker hits hard and does not sound muddy or distort at high volume levels. You can really crank up the volume on the Alaptronix AX440 speaker and it can produce enough volume to power an outdoor pool party or fill up a large room with rich full-range sound. Vocal performances sounded crisp and very clean – you get really nice ranges and it sounds as though the artist is standing right in front of you. The stereo separation on the AX440 speaker can be easily heard and allows you to pick up details in the music which you might not have noticed before. In short, the AX440 speaker is great for any music genre and produces a level of sound clarity at high volumes that you rarely get with Bluetooth speakers in a similar category. That being said, our only quibble with the AX440 speaker is that the bass starts to roll off at lower volume levels. The overall sound quality on the AX440 is pretty good considering how much volume you can get out of these speakers without any distortion. If you are looking for a powerful 30W speaker that can deliver on sound quality, the AX440 speaker is a great choice. The Verdict? The Alpatronix AX440 is one of the best wireless Bluetooth speakers that can pump out a full 30W of sound with really good sound quality. The speaker comes with two built-in large audio drivers that produce full-range stereo sound quality and the rear-facing subwoofer provides enhanced bass performance. The result is that music performances on the AX440 speaker sound very crisp and well-defined, with nice treble and bass ranges that sound very smooth up to maximum volume levels without any distortion. The AX440 is one of the few speakers that also support USB flash drive support and you can connect your thumb-drive directly to the speaker via USB to play audio directly from the flash drive. It also supports media formats such as mp3, FLAC and WAV. The battery life on the AX440 speaker is an impressive 5400mAh battery that can deliver up to 12 hours of continuous music playtime on a single charge – it can also double as a power bank for your mobile devices via USB. On the whole, the AX440 is one of the best wireless Bluetooth speakers with a solid 30W stereo performance and we highly recommend checking them out. The Anker SoundCore Pro is a 25W speaker that is designed to produce heavyweight sound quality. It is one of the best wireless Bluetooth speakers we have tested that delivers sound performance on par with higher end speakers. It features four professionally-tuned drivers and a digital signal processor to reproduce audio frequencies smoothly. It also features exclusive BassUp technology which allows you to boost the bass performance and add depth to the soundscape – this ensures that the bass performance is deep and present at low volume levels. The Anker SoundCore Pro provides up to 18 hours of continuous music playtime on a single charge and has a built-in USB port which you can use to charge your wireless Bluetooth devices. We also liked the fact that the Anker SoundCore is IPX4 waterproof rated and durable – it is impervious to rain, spills and splashes of water which make them ideal for poolside use. The entire package comes with the SoundCore Pro+ speaker, micro USB cable for charging and a user manual for easy reference. 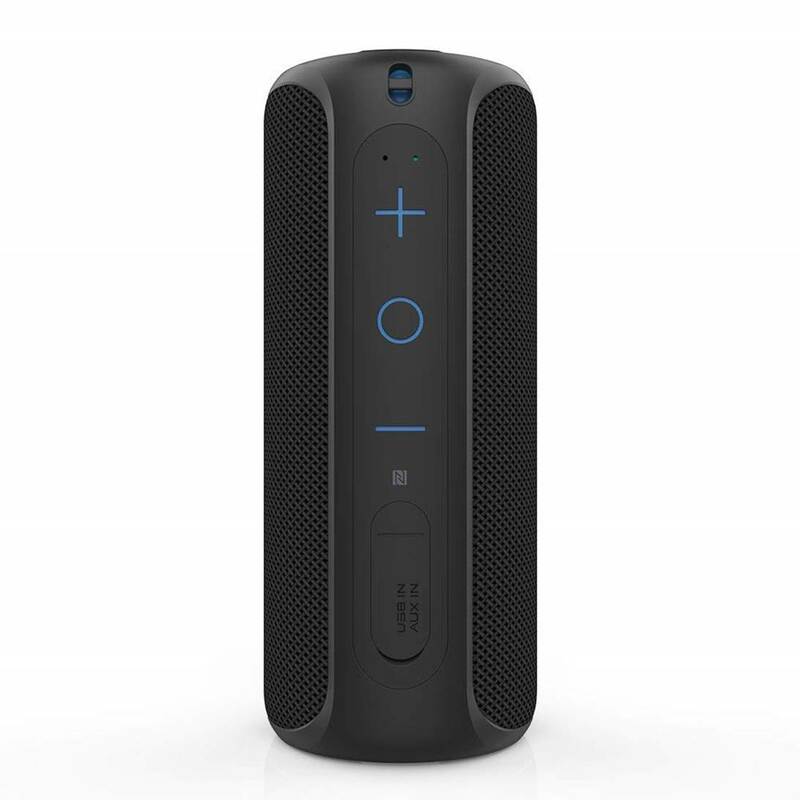 If you are looking for one of the best wireless Bluetooth speakers with enhanced DSP technology and deeper bass performance, the Anker SoundCore Pro is definitely worth checking out. The sound quality of the Anker SoundCore Pro is truly impressive considering how compact the speaker is. It uses two full-range drivers and 2 tweeters that deliver full-bodied sound performance and crisp vocals. We liked the fact that it also features professional digital signal processing which helps to make the treble and bass feel rich and immersive without rolling off at low volume levels. You can also crank up the Anker SoundCore Pro up to maximum volumes and it will not produce one bit of distortion – the sound quality is consistent and loud. Bass-heavy music genres such as electronic dance music sounded full-range and rich and the Anker speaker does a great job with handling the lower end frequency response without producing any muddiness. The full-range sound quality of the SoundCore Pro also allows it to produce music notes that you might not have heard before. Our only quibble with the Anker SoundCore Pro is that it is slightly heavy for a Bluetooth speaker, but this is compensated for otherwise excellent sound quality and consistent performance. The Verdict? The Anker SoundCore Pro is one of the best wireless Bluetooth speakers that offers 25W of full-range sound. We liked the sound performance of this speaker – vocal performances were crisp, clean and very well-defined, while the bass response goes deep and feels very punchy. The Anker BassUp technology that goes into this speaker allows it to project the low-end really well without any muddiness or distortion at high volume levels. We particularly liked the fact that the SoundCore Pro features an 8000mAh battery that can deliver up to 18 hours of continuous music playtime on a single charge; it also has a built-in USB port with PowerIQ fast charging that allows you to play music and charge your device simultaneously. To top it off, the entire speaker is IPX4 water-resistant which protects it against rain and splashes of water. It features the latest Bluetooth 4.2 technology which provides high-quality wireless sound transmission. Overall, the Anker SoundCore Pro is one of the best wireless Bluetooth speakers that deliver superb sound and we highly recommend them. The WZK 10W speaker is one of the best wireless Bluetooth speakers designed for outdoor sports. It is essentially a shockproof speaker with IPX7 waterproof resistance and a rugged design. The WZK speaker can deliver crystal clear sound performance with deep bass and comes with dual high-performance drivers and passive subwoofers for crisp highs and bass reproduction. The speaker comes equipped with dual 5W speakers and has a full-range sound output for quality music performance. It also has decent volume for an outdoor speaker and can project sound reasonably well. We liked the fact that the WZK speaker comes with a high-capacity 2200mAh rechargeable battery that can deliver up to 10 hours of continuous music playtime on a single charge. Furthermore, it has a built-in microphone that can be used to answer calls on the go. It’s a sleek and one of the best wireless Bluetooth speakers for the outdoors and we highly recommend them. The sound quality of the WZK surpassed our expectations from what you would expect of a 10W speaker. It produces very clean sound quality with nice bass and decent treble ranges. The speaker produces a surprising amount of bass that hits hard and goes pretty deep – it adds plenty of depth and flavour to the overall music performance. We also liked the fact that you can crank up the volume on the WZK Bluetooth speaker and it will produce distortion-free sound quality at high volume levels. The midranges sound well-defined and clear, and the bass response is pretty good. The wireless Bluetooth connectivity on the WZK speakers works like a charm and can connect to virtually any Bluetooth enabled device. Our only quibble with the WZK speaker is that it is not as powerful as the JBL Charge 4 and produces less volume as compared to the JBL. That being said, the sound quality and performance of the WZK speaker is really decent for a 10W speaker and the 10 hour battery life makes this speaker a worthwhile investment. It comes with an IPX7 waterproof rugged design that is shockproof, so you don’t need to worry about dropping the speaker while taking it outdoors. The Verdict? The The WZK Speaker is one of the best wireless Bluetooth speakers with a fully rugged and shockproof design with 10W of sound output. While it’s not the best performing speaker that we have tested so far, it is quite attractive due to its sleek design and IPX7 waterproof rating which makes it perfect for outdoor use. You can practically expose the speaker under water or rain without having to worry about the speaker. Furthermore, the dual 5W drivers and passive bass radiators produce pretty good full-range sound quality with nice bass tones and lower frequency ranges. The highs and midranges are crisp and well-defined, and the speaker does not distort when cranked up to maximum volume levels. We also liked the fact that the WZK speaker has a built-in microphone that allows you to take hands free calls when connected to your smartphone device via Bluetooth. Overall the WKZ speaker is one of the best wireless Bluetooth speakers we have tested that looks really sleek and durable and is worth a closer look. The Creative D80 is one of the best wireless Bluetooth speakers that has a modern design and two powerful 3” drivers that deliver full-range sound performance. The speaker is designed to stream music wirelessly via Bluetooth connectivity and also has a built-in auxiliary port for other portable device. You can also stream music wirelessly from your computer to the Creative D80 speaker with the Creative BT-D1 Bluetooth USB transmitter. The speaker has a wireless Bluetooth range of up to 30 feet and is compatible with virtually any Bluetooth enabled device – it also comes with a handy Bluetooth Connect button which allows you to toggle between two pre-paired Bluetooth devices. We also liked the fact that the D80 speaker has a built-in power adapter that allows you to connect to the mains via a power cord for easy charging. The Creative D80 speaker is designed to be portable and can be easily placed inside a bag pack for convenience. The entire package comes with the Creative D80 speaker, regional AC cords and quick start guide for easy reference. The sound performance of the Creative D80 speaker is very good for its size and price range. It has decent volume and the sound quality is pretty crisp and smooth. The bass response from the speakers goes surprisingly deep and hits pretty hard which is a nice added touch. The sound quality via the Bluetooth connection works fine, but we got noticeably better sound quality using an audio cable with the built-in auxiliary input jack. We were able to test the Creative D80 speaker at every volume level and the speaker does not produce any distortion – you can crank it upwards to maximum volume levels and the volume remains consistent and clear. We also liked the volume range on the D80 speaker – the sound quality remains consistent and does not roll off at lower volume levels which is a good thing. Vocal performances sounded particularly crisp and well-defined on the D80 speaker – with nice timbre ranges and crisp highs. On the whole, we were quite surprised at the sound quality of the D80 speaker and it has rather full-range sound, good bass and nice midranges. The Verdict? The Creative D80 speaker is one of the best wireless Bluetooth speakers that has a clean and modern looking design. The speaker is a lot larger than we expected and is 16” long and around 3” deep. The speaker has a really sleek and clean design with a nice black speaker cloth covering the front of the speaker. We thoroughly enjoyed the sound quality of the D80 speakers – although the drivers are 3”, they deliver full-range sound quality and a surprisingly amount of bass. The two 3” drivers pump out crystal clear sound quality that does not distort at high volume levels or roll off at lower volume ranges. The wireless Bluetooth connectivity also works like a charm and pairs almost instantly with compatible Bluetooth devices. While it’s not the best wireless Bluetooth speaker available, it does provide really good value for money and looks pretty neat with its modern front-facing design and decent sound quality.